I imagine there are thousands of students who miss Mum’s cooking. Culturally and regionally there must be food that you miss more than any other food in the world. 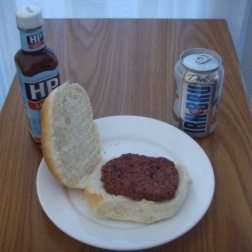 Lorne sausage is a square shaped sausage that originates from Lorne Street market in my beloved ‘City of Discovery’. Well I have made a bit of a discovery of my own and thanks to good old Marks and Spencer I can now create this little gem.